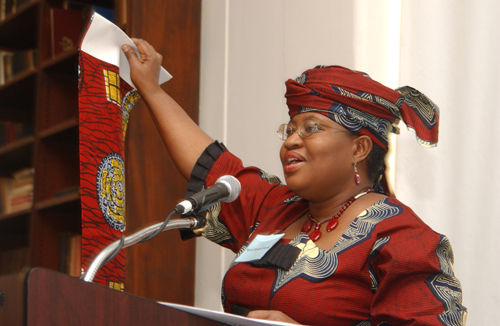 “What a tangled web we weave, when first we practice to deceive,” goes the poem by Walter Scott, and it looks like the fall out from the fuel subsidy probe and the Farouk Lawan bribery scandal has left a tangled mess for the cordinating minister of the economy, Dr. Ngozi Okonjo-Iweala to unravel. The probe report released earlier this year, named high-level officials as well as private sector individuals who had illegally received $6.8 billion in fuel subsidy funds. And Okonjo-Iweala is looking to collect, compiling a database of companies and individuals found culpable for collecting the funds without proper license to. In essence she has to reinvestigate every case of fuel subsidy collection and make sure the numbers all tally. Last week, Nigerian Minister of Finance Ngozi Okonjo-Iweala said the ministry is working to identify companies that took subsidy funds and did not provide fuel. She says Nigeria will ask for the money back. “If we find that, for instance, we paid and it cannot be documented that that payment led to a genuine supply of products then we shall be asking those people to refund us,” said Okonjo-Iweala. While the minister was revealing her plans, however, Lawan was caught up in his own scandal. Madam minister, i pray God will help u to do it, nigrerian leaders love to talk without act on it ,act fast,nigerians are wating,God is washing us.